If it has “Quentin Tarantino Presents” on the front of it, you can be sure a movie is going to be a live-action graphic novel, with all of the wondrous absurdity and excitement that implies. From the red-band trailer released today, The Man with the Iron Fist appears to be just that, . 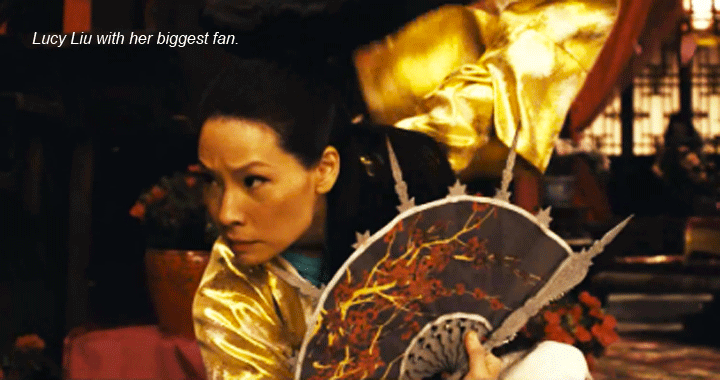 We love ourselves some Lucy Liu. She’s not only cool and a damned good actress with a fantastic sense of humor, she’s a great gal personally. We also love how she’s aging—we’re seeing a whole spectrum of Grand Dragon Dame roles opening up before her. Iron Fist appears to be an update of Mortal Combat, and will probably do those numbers at the box office with the same demographic, fifteen years later and inflation factored in. There are definite shades of Kill Bill 1 in here, which is presumably QT’s contribution, if it isn’t a direct homage on the part of director RZA, the polymath producer from the hip-hop group Wu-Tang Clan. Apparently they’re great friends. The flying eyeball made us blink, and reminded us of Marcus Nispel‘s Pathfinder, in which the eyeball is skewered with an arrow. Gross, but what you can’t see doesn’t hurt.